And in this case, "what's inside" is Nutella-esque deliciousness. Trader Joe's does offer their own jar of Nutella-esque deliciousness, although it's almond-based, rather than hazelnut-based like the original. However, these happy, round little roulette-looking fellows boast a hazelnut cocoa cream, virtually indistinguishable from actual Nutella. I'm a big fan of both hazelnuts and almonds, and in the end, I couldn't care less which nuts are in my cocoa spread...as long as it tastes like cocoa...and it does. 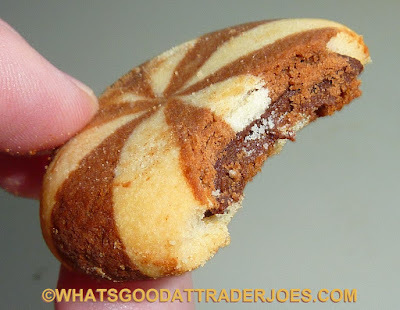 So if you like cocoa cream, you'll like the filling in these. It's what's outside that I wasn't as big a fan of. The cookies were more crumbly than "crispy" in my humble opinion, and a tad dry apart from their scrumptious centers. The outer cookie layer is slightly sweet, but overall not particularly flavorful, rich, or memorable in any way. I must confess I didn't attempt dipping them in coffee or milk or anything—and I should have. I could see them being highly dunkable, which might have greatly benefited these cookies in terms of their slight dryness and dullness. Sonia didn't mind the outer cookie layer as much, and she thinks it blended well with the cocoa filling. She's certainly not wrong there, but I'd just as soon take any other decent crispy cookie or shortbread cookie and slather them with cocoa spread, rather than return to these elegantly-packaged and pleasantly-presented "pinwheels." But don't get me wrong, I'm not hatin'. They're still delicious on the inside—worth every penny of $1.79. I had forgotten they were so inexpensive. The lovely Sonia shall bestow these pinwheels with four out of five stars. Put me down for three.